The Grammy's is this Sunday and last night (January 25th) Janelle Monae posed on the carpet at the 2018 Warner Music Group Pre- Grammy Celebration at The Grill & The Pool Restaurants in New York City. 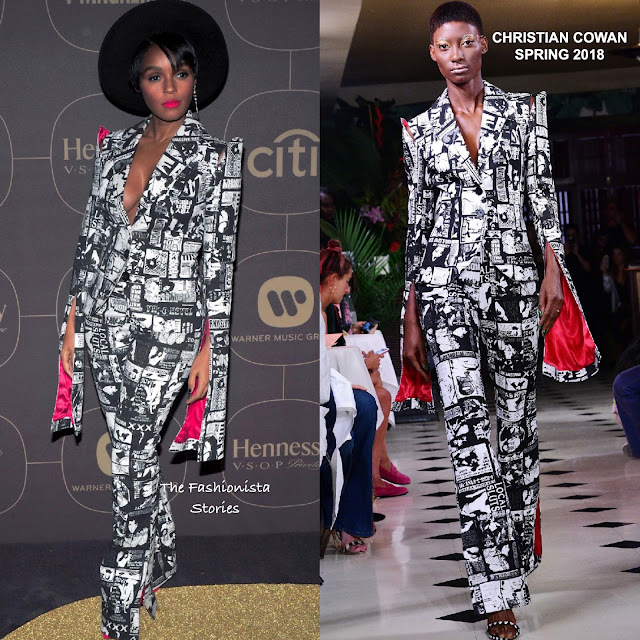 Working her signature hues, she wore a CHRISTIAN COWAN SPRING 2018 black & white printed two-piece suit with cutout shoulders, split sleeves and contrasting red underling. Sometimes Janelle tends to over accessorize her look but on this occasion, she scaled bacon the jewelry which was a good idea. This is a winning look for Janelle and the red boots sealed the deal. She finished up with a black felt hat & red lips. What do you think of Janelle's look?